The first new breeding pair of steppe Saker falcons has arrived in Bulgaria Monday as the efforts start to reintroduce this rare species in the Balkan country. The project for the resettlement of steppe Saker falcons in Bulgaria is being carried out by the is "Zeleni Balkani", i.e. "Green Balkans", NGO and the Bulgarian Academy of Sciences. 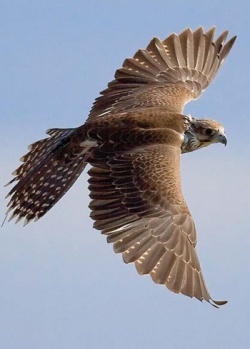 The steppe Saker falcon is a big, strong bird of prey with large feet and pointed wings. It is larger than the peregrine falcon, and has a very wide wingspan for its size. The species originated in southeast Europe and Asia. There figures for the worldwide population of Saker falcons are approximate, but it is believed that there are only 1 000 pairs of these birds left in Russia, and as little as 130 pairs in Europe. especially in open hilly areas and Danube River valley.Since 2000, however, the population estimates vary between 2 and 15 breeding pairs. Scientists say the decline of the steppe Saker is caused by the regional extinction of their preferred prey.